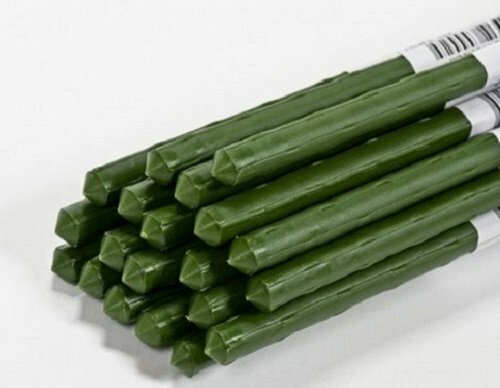 Quantity of (300): Panacea 89787 60" x 7/16" Green Plastic Coated Metal Plant Support Stakes. Metal Core With Green Plastic Coating For Strength .Rust Resistant Plastic Coating Can Be Re-Used From Year To Year. Much Stronger Than Traditional Bamboo or Wood Stakes .Approx 7/16" thick. Closed on Both Ends to Keep Moisture Out .Pointed On One End For easy Soil Insertion. "Grippers" on Stake Help Prevent Plant Tie Slip-Down.